More than 71% of US internet users will access a social network at least once a month this year. From a distance, Facebook has easily maintained its place as the leading social platform, reaching 60.6% of internet users. But cracks are beginning to show due to the platform’s ongoing loss of teenage users. By 2022, Facebook’s share of internet users will slip to 60.2%. The number of Facebook users in the US will rise 0.9% to 169.5 million in 2018, driven by uptake among older age groups. However, the network will experience declines between 5.6% and 9.3% among younger users under 25, representing a loss of 2.1 million. The biggest beneficiary of this outcome will be Snapchat. By the end of this year, 68.0% of internet users ages 12 to 17 will use the platform regularly. Snapchat’s penetration among internet users in this age group will outstrip that of Facebook and Instagram (47.2% and 43.6%, respectively). Instagram’s user base will increase to 104.7 million in 2018, up 13.1% from 2017. Platform growth will be driven by users 35 and older creating profiles and connecting with (likely younger) family members who have become less active on Facebook. Mobile phone messaging is not as common as social networking among internet users, but the user base is sizable. This year, 53.6% of US web users will access a mobile phone messaging app, and that share will climb to 58.1% by 2022. 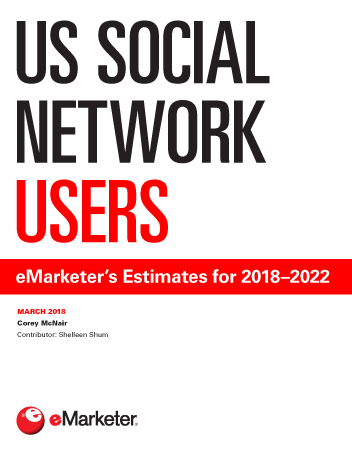 "More than 60% of US internet users will access Facebook at least once per month this year, ahead of Instagram (37.4%) and mobile-only Snapchat (30.9%)."